A cooking workshop at Espai Boisà is a whole day full of fun and learning a lot new things. But what contains a Barcelona cooking workshop actually? That is what I am going to tell you in this post!! 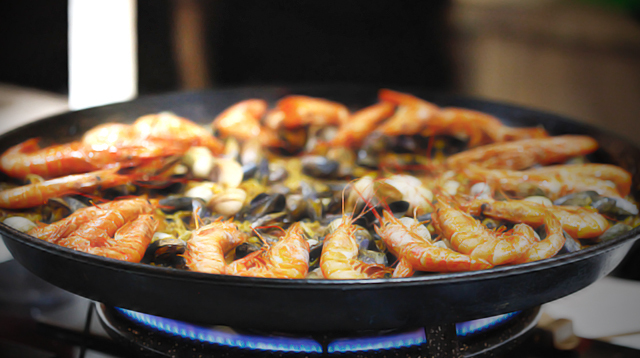 The traditional Tapas & Paella cooking classes at Espai Boisà is a very popular and a fun workshop. It starts with everyone gathering around in the garden corner. It is a gorgeous spot where everyone can relax, talks to each other and sit there to enjoy their drinks. When everyone arrives and everyone has finished their drinks, the whole group gets ready to go to the local Ninot’s market. The chefs tells about the market and shows you where she buys all the products for the Barcelona cooking workshops. She shows you here favorite spots. You also get time to look around, buy some products or drink a coffee. After the market tour the whole group goes back to Espai Boisà. It is time to start the Barcelona cooking class. The chef tells us about the cooking workshop, she tells about the products, the food and the recipes. She explains the recipes so that you know what to do. Now it is time to start cooking, time to put a apron on and start cooking! The kitchen is really big so everyone has their owns place to cook. When you are cooking the waitress walks around and makes sure everybody has enough the drink. She can also help you with other stuff you need. The chef looks around and gives advice about cooking the dishes. You lead and the chef coaches. When all the dishes are made, everyone takes place at the big table that the waitress made ready for you. Now it is the time to relax and enjoy. When everyone has a nice drink. We start severing you your own creations. You in your own restaurant! It is a whole day full of new culinary experience, seeing parts of Barcelona, learning about culture; learn about cooking and most important have lots of fun!! If you are around Barcelona, don´t miss this opportunity! Come in and visit Espai Boisà!